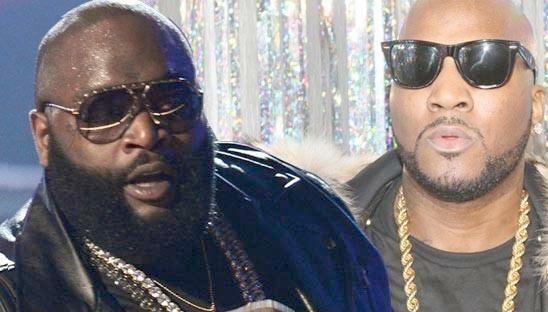 *Saturday night’s intense backstage dust up between the crews of rappers Rick Ross and Young Jeezy – at the BET Hip Hop Awards – was captured on somebody’s smartphone and, as usual, somehow it found its way to TMZ. In the video, security can be seen stepping in between the various combatants almost immediately, separating everyone before the fight got out of hand. A shirtless Rick Ross can be seen yelling before being escorted away from the scene. Whoever Ross was yelling at tried to follow after him, but security stepped in before he could get there. There needs to be an island that all these fools should go too! That way we will never have to hear from them again. Act your age not your shoe size! Jean > > > You couldn’t have said it any better. I guess we should come to realize that ignorance is a part of their DNA. Grown azz “old” fuc*&&ng men, oops, I mean old fart little boys need to sit their azz down somewhere. They are too damn old to be acting like that. SMDH! I read about this over the weekend, but can someone tell me if RR took his shirt off again? Now that’s gross!